Most record turntables use an adjustable tonearm counterweight with an independently adjustable tracking force dial to apply tracking force, which is the amount of vertical pressure keeping the stylus -- or needle -- against the record surface. Accurate tracking force is important for good sound reproduction and to prevent damage to records and the stylus. Before setting the tracking force, the counterweight needs to be adjusted to balance the tonearm. Adjustments to the tracking force dial and the anti-skating control, which controls horizontal pressure on many turntables, are also part of balancing the tonearm. Unplug the record turntable and turn off the amplifier or disconnect the audio cables. Attach the cartridge and stylus to the tonearm if they are not already attached. Leave the stylus guard --if applicable -- in place. Level the turntable front to back and side to side using a small spirit level. 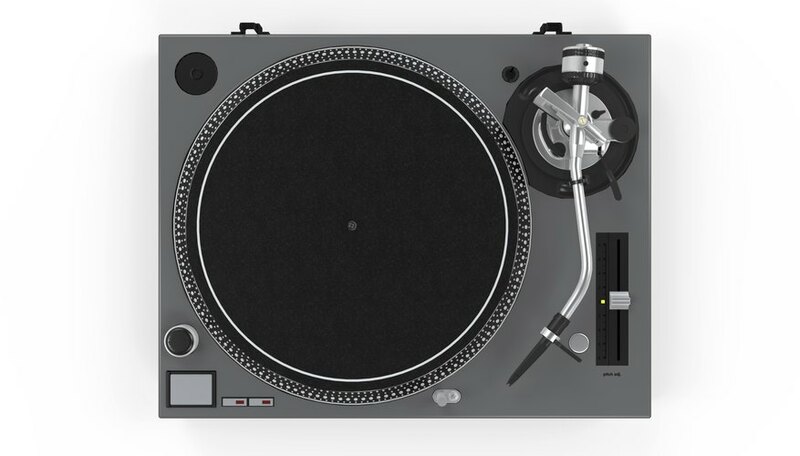 Set the turntable anti-skating control to zero if your turntable is equipped with one. The anti-skating control is typically a dial located on the turntable surface near the base of the tonearm or under the tonearm. Unlike the tracking force dial, it usually shows positive and negative numbers such as -3, -2, -1, 0, 1, 2 and 3. Move the tonearm sideways to a position over the record platter and hold it approximately level. Continue holding the tonearm and release the tonearm lifter, if present, so that the tonearm is capable of moving down to the surface of the platter. Hold the tonearm level and loosen your hold so that you can feel if it is going to move up or down if released. If it feels like it will move up or down if released, hold the tonearm with one hand while slowly turning the counterweight with the other hand until it feels like the tonearm will stay level when released. The counterweight may need to be turned clockwise or counterclockwise. Carefully release the tonearm but do not let it fall to the platter. If it stays level, it is balanced. If it does not stay level, hold the tonearm with one hand and turn the counterweight slightly with your other hand until the tonearm stays level -- parallel to the record platter and with the stylus above the surface. Move the tonearm back to the rest. Turn the tracking force dial, which is located in front or behind the counterweight, until it indicates zero. The counterweight should not move when you are turning the dial. Turn the counterweight until the tracking force dial indicates the appropriate tracking force for the cartridge. Do not turn the dial; it will turn as you turn the counterweight. The tracking force is stated in the manual or specifications for the cartridge and is usually between 1.25 and 2.5 grams. If you do not know the tracking force for your cartridge, use 2.0 grams. Set the anti-skating control to the same number as the tracking force. If the record skips, make small adjustments to the anti-skating control before increasing the tracking force. If the cartridge uses a removable stylus guard, remove the guard and balance the tonearm again for slightly increased accuracy. For the most accurate measure of tracking force, use a tracking force gauge to set the tracking force. Balance the cartridge or stylus whenever you replace or remount it. Be careful not to drop the tonearm onto the platter during the balancing process. This can damage the stylus. Tracking force set too high can damage the stylus and wear or damage records. Tracking force set too low can damage records by allowing skipping. When moving the turntable, remove the cartridge and counterweight to reduce the stress on the tonearm bearings.